Did your builder forget to install switches on both ends of a long hallway, or are there more convenient locations for your switches? With Aqara&apos;s light switch, you can easily control the same lights from two or more locations without new wiring. Xiaomi Aqara Wireless Switch is an innovative remote control with ZigBee wireless communication technology. With three-way switches, you can control one lamp with two switches, e.g. light switches at both top top and bottom of stairs. Adding a 2nd wired switch requires pulling new wires which is labor intensive, time consuming, and intrusive. which can be pressed for more than 50,000 times (normal use for 20 years). Made up of high-quality anti-fire materials, the panel is safe and durable, it will provide you with a rapid and convenient operation experience. You can match Aqara&apos;s Light Switch with other Mi Sensors to achieve various functions. Lead a smart life from now on. More ZigBee devices connected to the system means a better user experience. 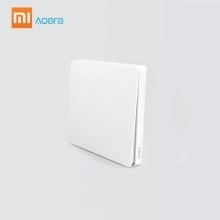 Xiaomi Aqara wall switch Wireless version: 1 Key, 2 Keys Available. Can be used as a key doorbell, SOS emergency call. Simple design and high quality, flexible installation, lower power consumption and less labor cost, smart phone control. Match with Mi Multifunctional hub or Aqara Air Conditioner Controller to connect other Aqara wireless switches to create free life. Much more than just a light switch, Aqara&apos;s Wireless Switch is an intelligent scene controller, with industry standard 86mm size, easily installed and used once being affixed. Do your guests have to bang on the door to announce their arrival? The simplest solution is to affix Aqara&apos;s Wireless Switch as the doorbell. You can also set the ringing sound as you wish, personalized to your favorite tone. Simply place an Aqara Light Switch on your bed stand and with a single click, turn off all lights in the home. (*This function shall be matched with Aqara Light Switch Zigbee Version or Mi Plug ZigBee Version). 2, Functions shall be matched with Aqara Light Switch (Zigbee Version) or Mi Plug (ZigBee Version).